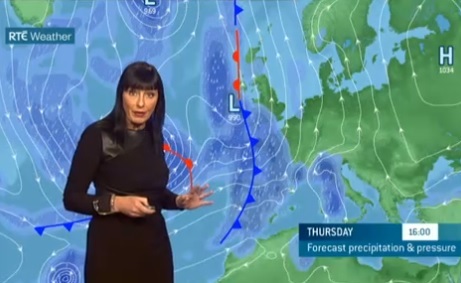 Jean Byrne weather forecast on RTÉ. Met Éireann has warned of a storm risk toward the end of a mild and unsettled week of weather. "At the moment there is a risk of extremely windy possibly stormy conditions at the end of the week on Friday," Meteorologist Jean Byrne warned in her Sunday night forecast after the RTÉ news. While it will be windy all week, Met Éireann is predicting a mild and almost warm week with temperatures hitting 20 degrees by Wednesday. She said a very active weather system is expected to hit on Thursday night into Friday morning bringing with strong winds and heavy rain. Met Éireann's weekly forecast below picture. Blustery today with strengthening south or southwest winds. Outbreaks of rain will affect parts of north Connacht and Ulster but it will be largely dry elsewhere with just the odd shower. Most areas will be cloudy but a few sunny spells will develop in the south and east. Top temperatures of 14 to 16 degrees.